« Should You Choose Stamped Concrete or Pavers for Your Commercial Hardscaping? Soil erosion can wreak havoc on your landscape. Learn the signs and what to do about it. Soil erosion might seem like a fact of life, and to a certain degree it is, but that doesn’t mean that it doesn’t take a toll on the health of your landscaping and property. Soil erosion can actually take away the good parts of your soil (nutrients) and put nothing in their place. Here are some easy ways to identify and treat soil erosion around your property. How Can I Identify Soil Erosion? Cracks: after soil leaves its original place and goes somewhere else, you might begin to notice cracks in the soil. These cracks form due to the loss of nutrient-rich soil and the intense dryness of the ground. 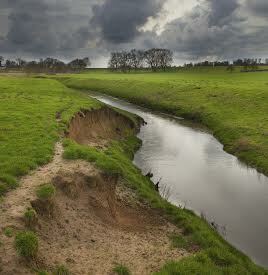 Gullies: If you notice a small riverbed-like gully in your yard, it could be as a result of water and soil run-off. You can actually follow the gully to see where the soil and water from your property are ending up. Failing Plants: plants in your yard rely on healthy and nutrient-rich soil to stay healthy, so if you have plants in one part of your yard that are failing as a group, erosion might be the culprit. How Can I Treat Soil Erosion? Install plants, including grasses and flowers, to anchor the soil and prevent it from leaving or shifting. Lay down mulch over plant beds or other plant-free areas to prevent the soil from shifting and losing nutrients. Build a retaining wall to keep soil in place. This entry was posted on Thursday, March 23rd, 2017	at 3:41 pm	and is filed under Erosion, Landscaping Design	. You can follow any responses to this entry through the RSS 2.0	feed. Both comments and pings are currently closed.